Instead of buying a new home computer, I think I am going to set up our little netbook to serve as the home computer, with the help of a keyboard and mouse and 19" widescreen monitor. I think it will work, but we have to see. 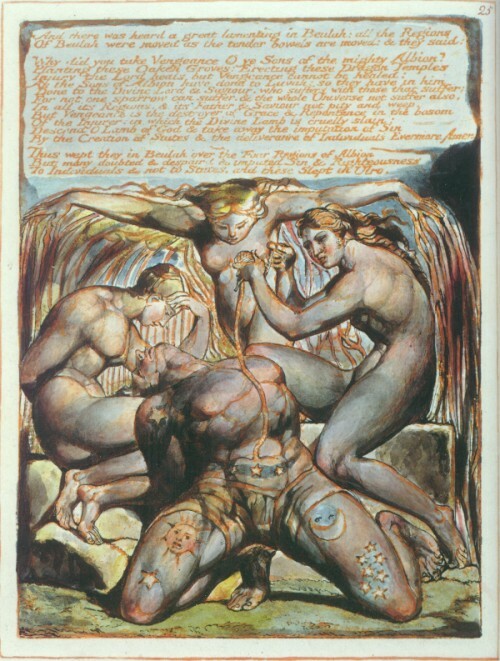 When B and L were here, they got us the best thing ever: a book of all of William Blake's illuminated plates. Complete: everything he ever did. A most beautiful book, an adult's book. And printed very, very well. Has me thinking about getting some more ink done. As I told B, The Marriage of Heaven and Hell was one of the first books that got me thinking about what it is that I think about now and was one of the first causes in a string of causes which led me away from what was my most likely reality in which I would have been a missionary to another reality. This was bothering the hell out of me because the best answer I was able to give up until now is, 'Uh, no dude, it's not' which isn't satisfying to anyone, especially not me. Well, watching the YouTubes this week, someone made a good point. If someone says, 'I believe in bigfoot' and you answer, 'There's no bigfoot', would you say that you and the bigfootist are both exercising the same amount of faith? On some level, I guess you are: we've fallen into this hole in the discussions here, which end up in a sort of, how do you know anything, epistemological mire. Because yes, I can't say with certainty that there is no bigfoot: I can only say that based on the evidence I have been presented and looking at the claims of the bigfootists, that it seems very unlikely that bigfoot exists. However, given that I cannot know all things, I have to say that, under the circumstances and given the claims made about bigfoot by people who claimed to have seen one, that it is very unlikely. We have, the person in the video pointed out, a pragmatic understanding of 'knowing' that works for us most of the time. You can see this in how we even differentiate between knowing and believing. I think this is because we mostly trust what we know and can test and what we can know and test against other people's knowledge. And given that criteria, it seems reasonable to say, that at least in the sense that Christians conceive of a god, that given what I know and what I can test, this god likely does not exist. This is not a statement of faith. It might be something else, but it is not a statement of faith. We are moving in just about four weeks now, so I am starting to call places and tell them that I am moving, that all of our services have to be moved to the new property. No problems yet and I am not expecting any. The worst is that we will be without the Internets for a week or so, which is actually a good thing in that I will probably be able to get more done in the week of the moving. My bike wheel is messed up and looking to cost £90 to repair. Small things here and there. My passport did not come and I'm trying to not think that right now, I should be in Barcelona with all my best friends from college. But I am not. I am here, and that's okay. Trying not to eat too much and trying to run. The family is all okay, too. Mei is laughing. Naomi is acting more and more like a little girl. Friends have been in town: one on Thursday/ Friday and another two from Saturday to today. It's been good: I've been to Oxford twice in the last four days and am going to London in a couple of hours, but I'm wicked tired. I name my 41.37 km on Saturday. Just short of a marathon, but my goal was 40km setting out and I just followed the path I had, so it wasn't a failure by any stretch of the imagination. A little slower than I would have liked, but I think I know how to shave off some time this weekend. We'll see. My body weight has gone up like 2.5 kilo since last Wednesday given all the eating I've done with friends. Hopefully tomorrow I will be able to get back on the horse. And proofing. I finished one project just barely over the weekend and got another one that is due by Friday. When it rains, it pours. But. B brought me a ton of dubstep music and I am dubstepping right now. Holy hell. This stuff is amazing. I finally finished the first book of 1Q84. In Japan, they usually put out long novels in two books. So I have finished the first 24 chapters or 554 pages, and have another 24 chapters to go. Very similar to Kafka on the Shore, I've decided, in that the two stories you are following slowly becoming interlinked in interesting and compelling ways. When you start out, you have to work very hard to keep up with the two, but by this point in the book, they are working off each other and the book is gaining steam. I read four chapters today out of necessity, basically. I love how Murakami doesn't change the world in drastic, but subtle ways, as if you are staring at a picture and swearing that it is moving, although you can never be quite sure. He puts his characters in these sorts of situations where they are unable to distinguish truth from perception of truth. Are there two moons or am I just seeing two moons? It's not perfect. His portrayal of women is not great sometimes. It's like he's living out a lesbian fantasy through a couple of characters. But it's a terrifying book. The dog died, one character says. Oh that's too bad, another says, it was young wasn't it? A page goes by and we find out the dog was torn to pieces in the front yard during the night. The butler at the house had to pick up the pieces with a paper towel. Last Saturday, we went the University of Cambridge Botanical Gardens. Boy, did we have a good time. This story about David Bazan just about nails how I feel. How do you break up with something that only ever existed in your mind? It's funny how easy it is to reject with your mind, but not your emotions. We are all still 7 year-old children, afraid of the Sunday school teacher. I am reminded that Nietzsche went mad with the realization that there had never been a god and he was responsible for his own fate. I wish it were easier... It is easier, however, then pretending that there's any truth to a myth.